effort to make. 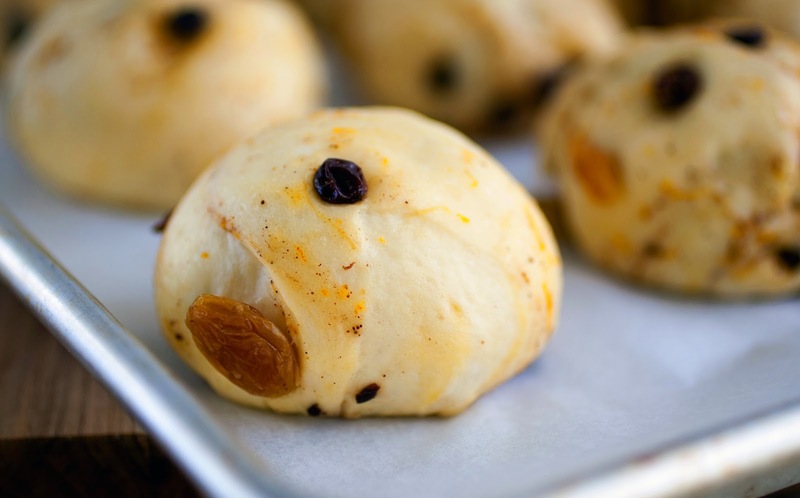 To ensure tender buns, make sure not to over-knead the dough when adding the dried fruit and when rolling the buns into rounds. 1. Mix the water and oil together in a measuring cup. 2. In a small bowl, mix the flour and salt together. 3. Add the oil mixture to the flour and salt mixture and mix with a wooden spoon until you get a soft, smooth paste. Cover and refrigerate until needed. 4. 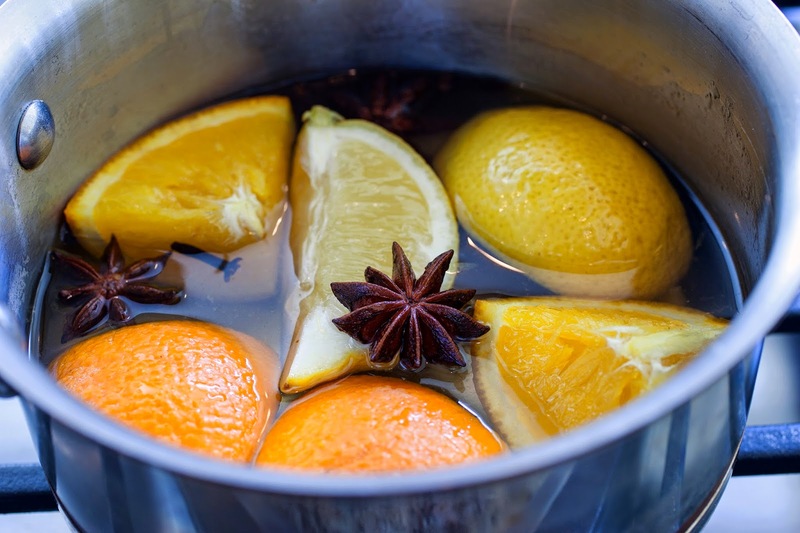 Put the water, sugar, orange, lemon, cinnamon, cloves and star anise in a saucepan and bring to a boil. Remove from heat and allow to infuse for 30 minutes. The glaze can be made a day in advance and stored in the refrigerator until ready to use. 5. Place the yeast in a large mixing bowl. Add the sugar and water and stir until the yeast and sugar are dissolved. Add the all-purpose flour and mix with a wooden spoon until well blended. This is the pre-ferment. 6. Cover the bowl and allow to ferment in a warm place until doubled in size, 30 to 45 minutes. 7. 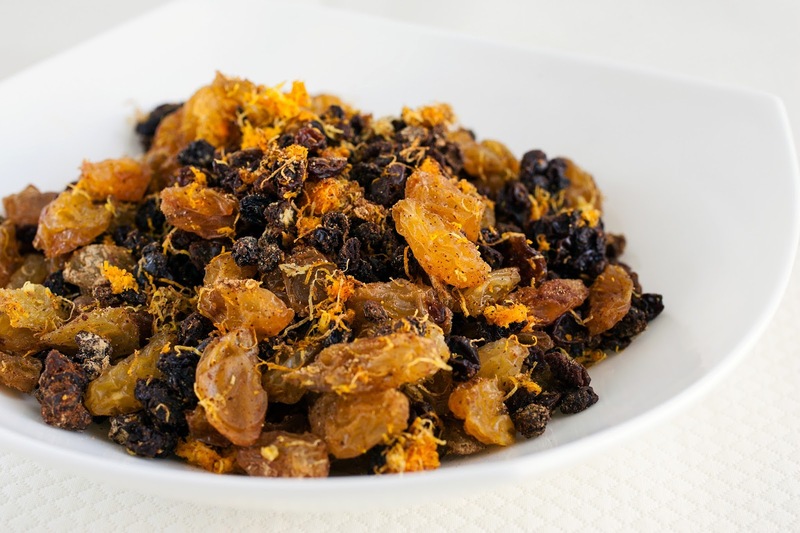 Meanwhile, combine the dried fruit, spices and zest in a bowl and set aside. 8. In another large mixing bowl, combine the bread flour and salt (this is the dry mixture). 9. Pull small pieces off the butter and lightly rub into the dry mixture using your fingertips until there are no more big lumps of butter. 10. When the pre-ferment has doubled in size, add the egg and pre-ferment to the flour mixture and mix with your hands until it comes together. Cover and let stand for 10 minutes. Pull a portion of the dough up from the side and press it into the middle. Turn the bowl slightly and repeat this process with another portion of dough. Repeat another 8 times. The dough should start to resist at that point. Cover the bowl and let stand for 10 minutes. Repeat the pulling and resting another 3 times. 11. 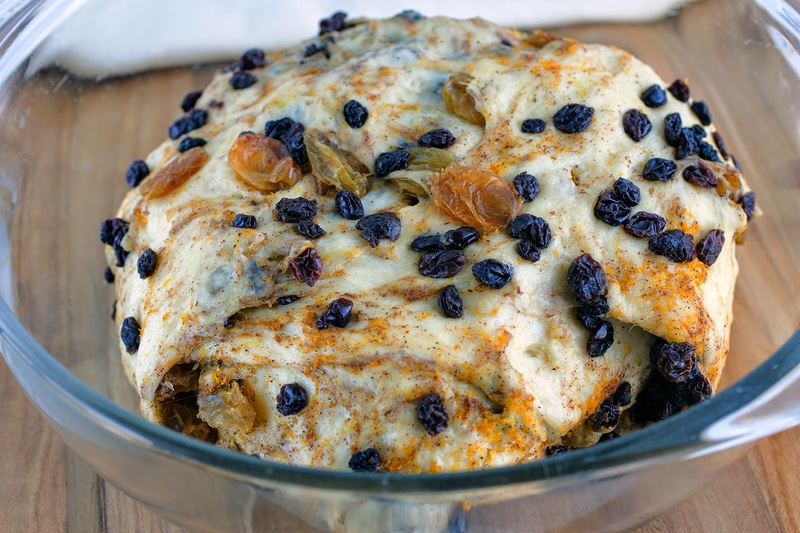 Add the dried fruit mixture to the dough and knead as gently as possible until thoroughly mixed in (over-kneading at this point will make your buns tough). Cover and allow to rise for 30 minutes. 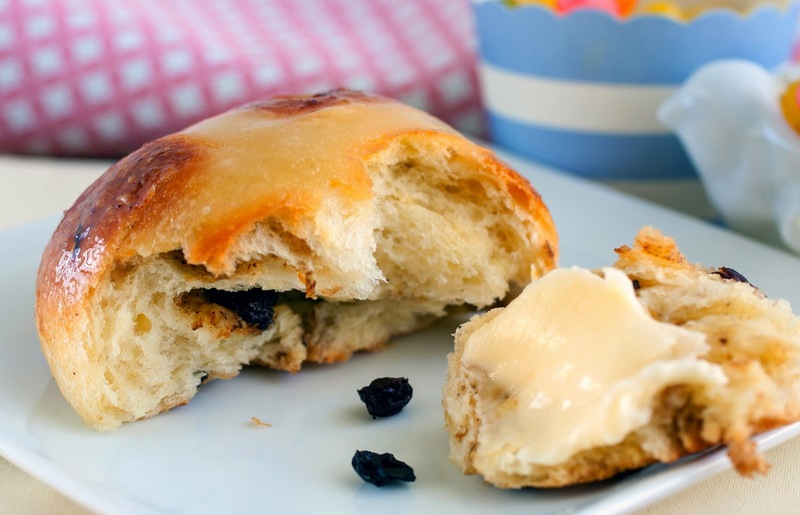 At this stage you can refrigerate the dough and continue the recipe the next day. In this case, let the dough sit at room temperature for about 15 minutes before continuing. 12. Line a baking sheet with parchment paper or a silicone baking mat. Lightly dust a work surface with flour. Transfer the dough to the surface and divide it into 15 equal portions (use a scale for precision). 13. 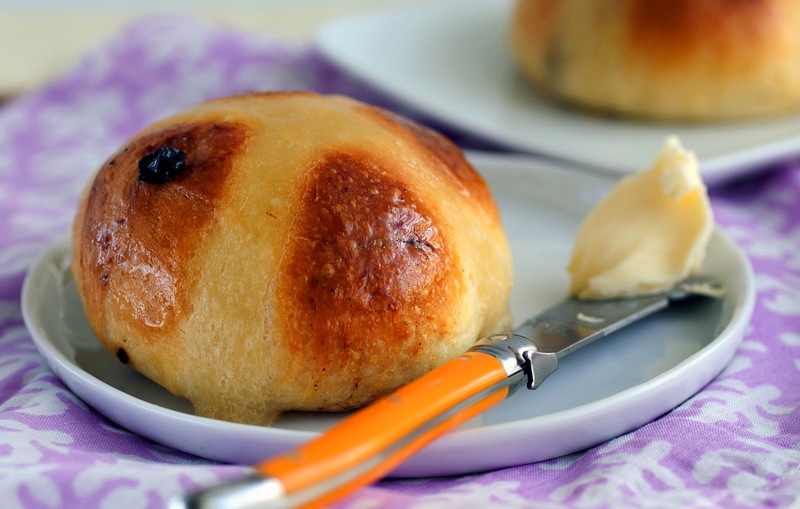 Take one portion of dough and roll between your hands until you get a perfectly round ball. Place on the prepared baking sheet. Repeat with the remaining dough, spacing the dough balls evenly and about an inch apart. Cover with a tea towel and let rise until double the size (about an hour). 14. About 20 minutes before baking, preheat the oven to 425°F. Place a roasting pan in the bottom of the oven to preheat. Fill a cup with water and set aside. 15. Fill a disposable pastry bag with the reserved mixture for the crosses. Clip off the point of the bag and pipe continuous lines of the mixture across the tops of the buns in both directions. 16. Place the baking sheet in the preheated oven and pour the cup of water onto the hot roasting pan. Lower the temperature to 350°F. Bake the buns for 15-25 minutes, or until golden brown. Place the baking sheet on a wire rack and brush the buns with the cold glaze. Allow the buns to cool on the baking sheet and serve with butter.